It’s time for another book review. 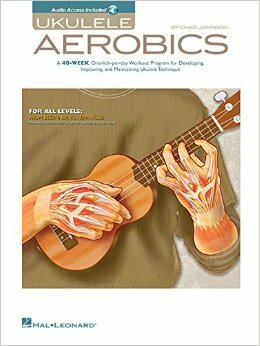 This time it’s Ukulele Aerobics For All Levels which is something a little bit different if you’re used to the standard type of ukulele book. Let me start by explaining why I bought this book. I wasn’t overly happy with my progress on ukulele – I feel like I’ve been able to play to an average level for quite a while now but have never really pushed on past that. I was looking for something that might help me develop my skills and take my playing to the next level and the title of this book sounded like it might be the one. At around £12 ($12) I figured it was worth a try so I grabbed myself the Kindle version. I’ve already mentioned that this book is a little different to any other ukulele book that I’ve previously bought or read. It’s almost entirely constructed of exercises and the whole book is presented in a weekly format. There are 40 weeks in total so you should be kept busy enough. You’re then given exercises to do each day that you play. This format might be a little dry for some players – I wouldn’t say it’s the most fun way to teach people to play but I’m ok with that. I’m the kind of person that likes a challenge. Each day in the book focuses on a certain skill – Monday is chord vocab, Tuesday strumming, Wednesday fingerstyle, Thursday scale exercises, Friday legato and Saturday licks and riffs, Sunday miscellaneous. I really like the idea of focusing on just one skill per day and that’s something that I often get lost with in my own practice sessions. I’ll either try and do too much or I’ll actually completely lose track of what I was supposed to be working on and end up playing a song I already know. Chad has actually written a version of this book for baritone too so if you’re a fan of the baritone, you can get involved. In terms of the level of this book, although the title states that it’s for all levels I think it’s a better book for an intermediate player, or perhaps someone who has already got a lot of the basics down (comfortable strumming, knows plenty of chords, can change between them pretty comfortably and has had a bit of a go at fingerpicking). The reason I’m saying that though, isn’t because the exercises would be too difficult for a beginner, it’s more to do with the format. I think as a beginner you’re more inclined to noodle around and want to learn songs than just purely practice and work on technique. The exercises themselves do start out at a level that would be easy enough for a beginner to get to grips with. I myself breezed through the first 10 or so weeks before I came up against anything that was challenging. I have a bit of an on off relationship with Ukulele Aerobics For All Levels. I really like the premise a lot and when I’m into it, I stick to it daily. The problem comes when I get thrown off my schedule a bit, I tend to just stop using the book and then come back to it in a few weeks. Maybe that says more about me than the book itself but reading around the various ukulele forums out there I’ve read similar things from others too. Once again I went for the Kindle version and much like Get Plucky With The Ukulele it was a mistake. The supporting video/audio files do not work on Kindle for Android or Kindle for Mac. This is a huge shame as the exercises that I got a lot from in this book were all timing based and although it really forced me to work on my timing, it would have been nice to be able to listen to the examples when I was really stumped. If you are planning on buying this book on Kindle, make sure the audio supports your version of Kindle. Bit of an update on this one – I emailed the author Chad Johnson directly about this (his email address appears at the end of the book) and he very kindly sent me the audio files. If you’re in the same situation as me then maybe that’s a solution for you. Would I recommend this book? Well that depends on where you’re at with your playing. If you’re a newbie that is just getting to grips with the ukulele then I think there are more appropriate books out there for you (namely Ukulele for Dummies). If like me, you consider yourself somewhere in the middle you probably own a few books already then I’d say definitely check this one out, you’ll definitely pick up something new from it. 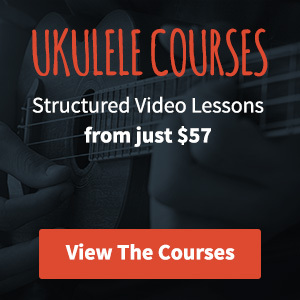 I was looking for materials to teach uke to my Sunday School class–I’m a guitar player and uke noob–and ran across one-chord songs. Brilliant! Lots of room for kids to learn rhythm and even “solo”! I am currently working through the Baritone version of this book, and would recommend it. It helps me to play every day.